The Union Beach Board of Education hired Settembrino Architects to design the renovations to the existing gymnasium. The existing multi-purpose flooring was in need of replacement due to worn areas and uneven surfaces. A new multi-purpose rubber flooring was installed with a custom designed logo of the school mascot. The room was also fitted with new acoustical treatments to reduce the echo and reverberation in the space. The walls received new acoustical panels located around the entire room perimeter. In addition to the wall treatment, ceiling mounted “wave” baffles were placed between the roof joists to further assist with the acoustics in the room. 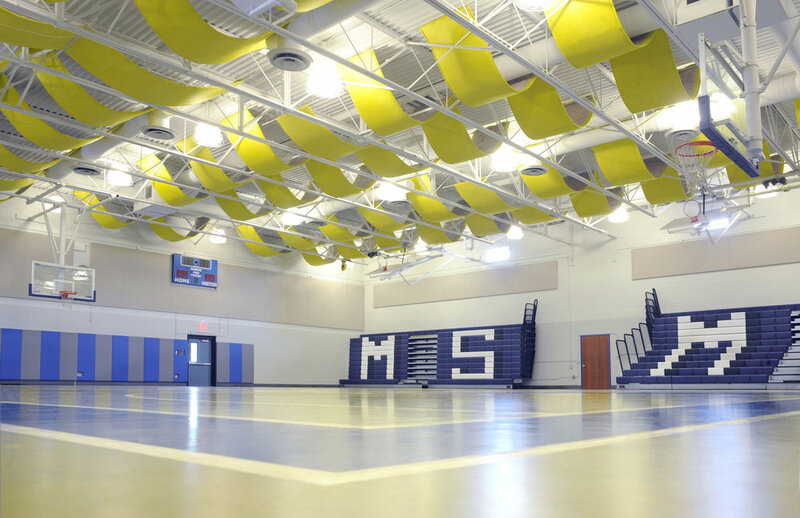 The lighting was replaced with high efficiency fixtures to provide an even illumination level on the gym floor.